The Palm Springs International Film Festival has a logo calculated to appeal to those of us who travel from snowy northern climes to attend: a palm tree composed of strips of film. As each film began and a short prologue listed the sponsors, I studied that logo and felt grateful that I was missing the frigid weather that descended upon Madison during our absence. It’s a clever design, also managing to suggest movies springing forth in abundance, which was certainly true of the festival’s offerings. Most New Zealand films are set in their home country, taking advantage of its magnificent landscapes and local culture. Dean Spanley (Toa Fraser) strikes me as quite different. Based on a Lord Dunsany fantasy novella, My Talks with Dean Spanley (1936), it was mostly filmed in England and is a costume piece set in the Edwardian era. Five years ago co-productions were rare things in New Zealand, but this is a Kiwi-U.K. film with an impressive international cast. There are Englishman Jeremy Northam as the narrator and protagonist, New Zealander Sam Neill in the title role, Australian Bryan Brown (perhaps most widely known as Breaker Morant) in a supporting part, and Peter O’Toole. The latter is spoken of as a possible best supporting actor Oscar nominee, though I fear that the film is too low profile for that. Dean Spanley is a feather-light but well-told tale of Fisk, a middle-aged man who pays a tense visit to his curmudgeon of a father (played by O’Toole) once a week. For something to do, Fisk takes the old man to a lecture on reincarnation, also attended incongruously by the local preacher, Dean Spanley. 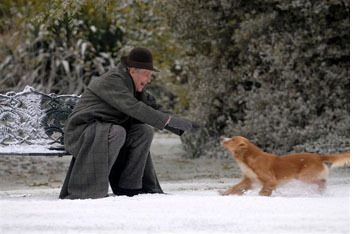 A friendship develops between Fisk and Spanley as it gradually comes out that Spanley seems to be the reincarnation of the father’s beloved childhood dog. The premise is made plausible by a gradual revelation of the premise, by Neill’s performance, and by some lyrical flashbacks. The whole thing is a surprising film to have come from Fraser, whose first feature, No. 2, was set in Auckland and concerned a family of Fijian descent. Yet it seems a sign of the New Zealand cinema’s health that he could take such an unexpected turn and tackle an English literary adaptation. Australian movieThe Black Balloon (Elissa Down) is a contemporary story set in a Sydney suburb. It’s a social-problem film, dealing with a teenage boy, Thomas, torn between his love for his severely autistic brother (a truly remarkable performance by Luke Ford) and his frustration at the effect the brother’s antics have on his own ability to fit in at his new school. The film is apparently aimed primarily at a teen audience (it won the Crystal Bear for “Generation 14plus – Best Feature Film” at the Berlin Film Festival), but the almost exclusively adult audience at Palm Springs seemed entertained and touched by it. Australian stars who have made careers abroad often return to support their native industry by acting in local films, and Toni Collette is impressive as the mother. I found it a bit of a stretch that the one sympathetic, understanding fellow student Thomas finds happens to be a gorgeous girl who also seems to have no friends among their classmates. Apart from that, it’s an entertaining and informative film. It does have one intriguing device in the pre-credits and credits scenes: several objects in each shot contain superimposed words identifying a number of the objects visible. The idea presumably is to suggest the fact that autistic people have excellent object recognition but difficulty understanding others’ emotions. I would have liked for the labeling to continue through the film, but I suspect most other viewers wouldn’t. Admittedly that would have distracted viewers from the narrative–unless we soon got used to it, which I suspect would have happened. At any rate, it’s a catchy way to introduce the story. Watching the Moroccan film Goodbye Mothers (Mohamed Ismail) was a disconcerting experience. At first it struck me as simply old-fashioned filmmaking, with multiple plotlines concerning three Jewish families living in Morocco at a time of increasing racial tensions. The stories are the stuff of melodrama, with a beautiful Jewish girl in love with a Moroccan man, a man debating whether to abandon his long-time friend and business partner to move his family to Israel, and the partner’s childless wife, who would be devastated by the departure of the family’s children, to whom she has been a second mother. In this age of short scenes, the film bases its action largely on extended shot/reverse-shot conversations, without much moving camera or many tight close-ups. Eventually I realized that the film looks very much as if it had been made around 1960, which is the period of the story’s action. The similarity can’t be coincidental. As with other Moroccan films I have seen, there is considerable emphasis on the music track, and here two or three scenes use the sweeping theme from Preminger’s Exodus. Indeed, the style is occasionally reminiscent of Preminger’s work of that era, as in shots that position characters precisely across the wide screen. There’s more cutting than Preminger would typically use, but it’s an interesting pastiche that lends some subtle overtones to the film’s action. Despite a wide range of performance styles and a somewhat schematic set of plotlines, the film is an intriguing attempt to use a throwback style to convey the period when the peaceful co-existence of Jews and Muslims in Morocco was breaking down. A few films do not necessarily a pattern make, but I’ve been struck by some echoes among the Middle Eastern films I’ve seen at this and other festivals. When the New Iranian Cinema came to international notice in the 1980s and 1990s, one narrative premise that several films shared led them to be labeled “child quest” movies. These tended to be simple searches or journeys: a boy trying to return his friend’s school notebook (Kiarostami’s Where Is My Friend’s Home?, 1987) or a girl trying to make her way through traffic to get home after school (Panahi’s The Mirror, 1997). Gradually disasters, natural and manmade, caused the quests to become more serious. They often still involved children, but the just as often the seekers have been adults. Kiarostami’s And Life Goes On (1991) dealt with a film director’s journey into an earthquake-devastated area to find the child actor of Where Is My Friend’s Home?, who happened to live in the worst-hit area. More recently, though, the disasters that create quests are wars in the region. My Marlon and Brando, the first feature of Turkish director Huseyin Karabey, deals with a actress in Istanbul. She has fallen in love with an Iraqi Kurd, and when the U.S. launches its invasion of Iraq, the two are cut off from each other. Increasingly frustrated and desperate, the heroine sets out to join her lover in his home in northern Iraq, even though the convoluted set of border closings forces her to go by bus via Iran. As she meets obstacle after obstacle and finds herself isolated in small villages where she cannot speak the local language, the film risks becoming monotonous. But audience attention is carried in part by a remarkable performance by Ayca Damgaci, who must carry every scene. At intervals we see videotaped messages sent to her by her lover. His effusive professions of love are juxtaposed with clips from the film where they had acted together, and these messages lead one to wonder just how sincere he is. Might he be leading her on through her grueling trek just to find disappointment? My Marlon and Brando reminded me of Under the Bombs, which I wrote about from the Vancouver Film Festival. (It was also shown at Palm Springs.) There a distraught Lebanese woman travels by cab into the southern area bombed by Israel in 2006, seeking her son. Both films stress the difficulties of ordinary people’s making their way through combat areas or having to detour around them. Another variant comes in Ramchandi Pakistani (2008), made by Mehreen Jabbar, one of several female directors who have emerged in the Middle East. The mischievous Pakistani child Ramchandi wanders away from his village in Pakistan. He accidentally crosses the border into India—a border marks only by rows of painted white stones, giving the child no indication of the danger he faces. His father follows in an attempt to find him, and both are thrown into an Indian prison for years, their unregistered status making release highly unlikely. The film then alternates between the plight of the pair and their fellow prisoners and the frantic efforts of Ramchandi’s mother to find out what has happened to them and to eke out a living while hoping for their return. The three films deal with different conflicts: U.S.-Iraqi, Israeli-Lebanese, and Indian-Pakistani. All three stress the separations of families and lovers by hostilities and the barriers they arbitrarily create for ordinary people. 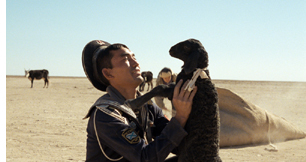 In contrast, the Kazak film Tulpan (Sergei Dvortsevoy) presents flat, limitless, arid plains of southern Kazakstan, where borders and conflicts seem so far away as to be irrelevant. Asa, a veteran of the Russian navy, does not go on a quest but has a pair of local goals. He seeks to marry the elusive Tulpan and to establish his own flock of sheep. As he struggles to achieve these goals, Asa remains an assistant to his brother-in-law Ondas, a tough, seasoned herdsman who keeps finding his ewes’ newborn lambs mysteriously dead. The film is director Dvortsevoy’s first fiction feature after a career as a documentarist, and he skillfully details the lives of Ondas and his family. There are two remarkable, squirm-inducing scenes of the births of lambs, handled in long takes that seem to make trickery impossible. Despite the hardships and disappointments, there are touches of humor, as when the local vet stops by to investigate the dead-lamb problem, accompanied by a bandaged baby camel in the side-car of his motorcycle and followed by its persistent, annoyed mother. A charming film and a crowd-pleaser. During the Q&A after the screening of Jerusalema that I attended, queries from the audience tended to center around how accurate its depictions of rampant crime and violence are. Director Ralph Ziman assured us that they are quite accurate, and indeed the film is loosely based on a combination of true cases. Johannesburg, he claimed, is the world’s most violent city. Whether that’s strictly true, I don’t know, but Ziman’s film is a polished, gripping depiction of one brilliant young student’s rise and fall (and rise?) as a criminal. The script, with its complex flashback structure, is tight and fast-paced. The cinematography is consistently imaginative and beautiful. (See images at top and bottom.) 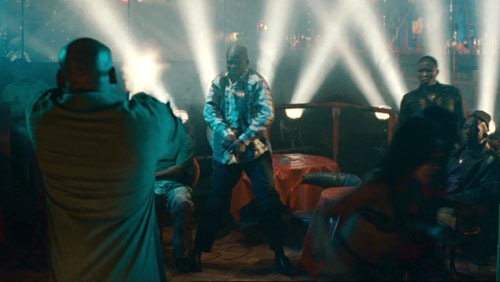 I can best describe it as Michael Mann shooting a gritty Hong Kong action film, but setting it among Johannesburg gangs. The Mann influence is palpable. At one point the characters watch a scene from Heat to learn how to ambush an armored car, and Mann is among those thanked in the credits. Jerusalema was South Africa’s submission for a nomination as the Best Foreign Film for the Oscars. Not surprisingly, it didn’t make the shortlist, being an action pic rather than the art-house fare that the Academy members favor. Its language is also a disconcerting melange of the tongues and dialects spoken in South Africa, including English. At times characters switch among languages in mid-sentence. According to Ziman, the script was written in English, and then the cast helped work out how their individual characters would speak the lines. 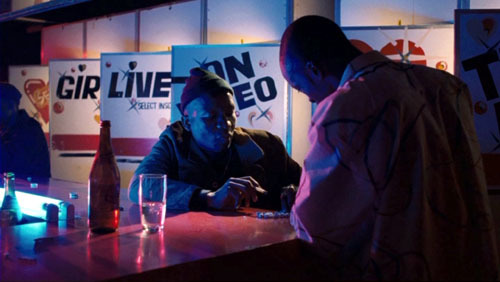 The basic story is familiar, with a teenager, Lucky, from Soweto accepted into a university but unable to pay his fees and intending to turn to crime temporarily to raise the requisite money. Naturally he tries to quit, only to be lured back. But Lucky uses his intelligence to work out a novel way to twist the law to his advantage, commandeering crime-ridden apartment blocks that have been allowed to slip below legal standards and buying them at bargain prices. It’s the dynamic style, though, that makes this so entertaining. It was one of my favorite films of the festival. Ziman announced that it had recently been sold for American distribution, but he would not reveal the name of the company before an official announcement. I’m not sure whether it would fit better into multiplexes or art theaters. Like so many recent films it seems to fall in between. (The Curious Case of Benjamin Button and Slumdog Millionaire are only the most recent examples that come to mind.) Its subtitles make it unlikely to find a really wide audience, but its violence might be off-putting to the art-house crowd. Wherever it ends up, it’s worth looking out for. During the festival, I was struck a number of times by how well-made films were that came from countries where production has previously been minimal. From South Africa, Kazakstan, Morocco, and Pakistan we see films that give the impression of having been made within a well-established industry. They adeptly use conventions familiar from festival-aimed art films or from classical Hollywood-style cinema. Clearly filmmakers in such countries have been seeing a lot of movies, even if they haven’t been making very many yet. The cliché about the cinema as an international language, almost as old as the medium itself, apparently remains as true as ever. Note: Variety‘s wrap-up of the Palm Springs International Film Festival, including the prizes awarded, can be found here. Bruges, Belgium is a tourist haven. This reconstructed medieval city boasts museums, canals, cafes, an impressive town square, and other attractions guaranteed to keep credit cards flowing through. It’s a wonderful place to stroll in the sunshine, shop, or watch windmills slowly spin. In alternating summers, though, Bruges plays host to people who prefer to sit in the dark. This strange cult includes professors, students, and cinephiles from all walks of life. For a small fee Belgians and Netherlanders can plunge into eight intensive days of viewing, lectures, and discussions. While tourists shuttle by unsuspecting, the devout are gathered to watch such items as Rebel without a Cause, the entire Niebelungen, and Destroy All Monsters. It’s the Zomerfilmcollege, funded by the Flemish side of the Belgian government and run by the Flemish Service for Film Culture in partnership with the Royal Film Archive. In English we’d call it Film Summer Camp. There are no papers or grades. It’s a college in the original sense, a gathering of minds for purposes of deepening knowledge and expanding ideas. It’s held in the Lumière cinema, a central three-screen moviehouse specializing in arthouse fare (and, for part of our stay, The Simpsons Movie). 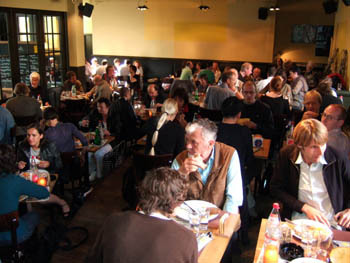 On the ground floor is a cozy bar, which also serves the lunches and dinners for the collegians. The whole building, like the atmosphere of the event, is unpretentious and welcoming. Typically there are two principal courses and a sidebar. This year, one course was on Fritz Lang, the other was on widescreen film, and the sidebar was devoted to the French cinematographer Henri Alékan (La Belle et la Bête, Wings of Desire). The schedule is fairly full. At 9:00 AM there’s a lecture, followed by a film screening, then lunch. After lunch, another lecture and another screening. Dinner follows at about 6:30, and evening events follow, with a film or special presentation at 8:00 and then at least one more film afterward. All films are in 35mm prints. Kristin and I had been lecturers here several times, but this year I came alone. The Lang cycle was to have been handled by Tom Paulus, who gave us Hawks last time, but illness kept him away. He was replaced by several other fine Flemish scholars: Hilde D’haeyere, Steven Jacobs, and Roel Vande Winkel. They supplied lectures on Lang and architecture, on his relationship to the German “street film,” on his relation to the Nazi regime, and on his American work. The retrospective gave a good sampling, running from the Dr. Mabuse films (1922) to Moonfleet (1955; very nice print). For Alékan, there was the filmmaker/ archivist/ novelist Eric DeKuyper, for whom Alékan shot A Strange Love Affair (1984), and the Belgian professor Muriel Andrin, who incisively introduced us to visual influences on Alékan’s aesthetic. Most lectures are in Dutch, but fortunately for me some are conducted in English. In previous years I’ve lectured on modern Asian film, Hollywood in the 1970s, and the history of film staging. This year my topic was anamorphic widescreen. The talks grew out of my research for an essay to appear this fall in my collection Poetics of Cinema. The week is now about three-quarters done, and I’ve had a great time. Using clips and slides, I started with a block tracing CinemaScope in the US, with my main examples being Rebel, River of No Return, Moonfleet (intersecting with Lang), The Girl Can’t Help It, and Compulsion. Tonight we’ll get our example of modern usage of the widescreen with a showing of Three Kings. The next three sessions concentrate on non-US usage of the anamorphic format. Le mépris screened today and will be discussed tomorrow. Oshima’s The Catch will represent a Japanese approach. On Sunday, we end with Johnnie To Kei-fun’s The Mission as illustrating one Hong Kong approach. By nice synergy, To’s Election and Election 2 are playing on other Lumière screens, so collegians can sneak off for some extracurricular viewing. I enjoy visiting the college, and not just because I like to lecture. A schedule of screenings negotiated by what’s available in a good print from the archive or a distributor forces me to confront films I haven’t studied before. Even for those I know pretty well, seeing them big and beautiful can stimulate new musings. And as any teacher will tell you, even going back over familiar material shows you something fresh. For example, I had always loved the way Nicholas Ray used deep space to link his young protagonists in the police station at the start of Rebel. But this time I noticed how Dean’s performance was fitted to the wide frame: He begins the movie prone and pretty much ends there. I also noticed how Jim’s gesture of covering the toy monkey at the start is echoed by his and Judy’s protective covering of Plato, and by the climax when Jim’s father covers him. Viewers more familiar with Rebel than me have probably noticed these rhyming gestures and attitudes, but finding them on my own, innocently if you like, fueled my interest in teaching a film I had never studied closely. Likewise, I wasn’t aware that the glasses motif in Compulsion is linked to imagery of blinding light, a kind of supernatural authority that not only points to the guilty party but also leads the monstrous, pathetic Judd to mercy. The dynamic is given diagrammatically in the closing and opening credits. My previous post was about watching movies small and super-slow; now I’m reaping the advantage of watching films big and normally. Today, watching Godard’s Contempt on the screen I was able to enjoy those motifs of color, light, and composition that move almost musically through every Godard film (See top of entry.) I was able to identify some more citations (the novel adorning BB’s fanny is John Godey’s noir Frapper sans entrer) and feel the full force of the bold geometry of the framings. I hadn’t noticed before that the first image of the table lamp in the apartment sequence prepares, inversely, for the villa steps in Capri. And I’d never noticed before how the last time Paul sees Camille, at the rocky outcropping that overlooks the seascape, she becomes that nymph seen in Lang’s rushes and identified as Penelope of the Odyssey. I expect to have some further fun with The Catch and The Mission, both of which will look splendid on the Lumière screen. I turned sixty on the day I showed Rebel. Being here, though, I don’t feel so old. I have to keep up with the collegians and the dedicated archive team–Stef, Tim, Vico, Esther, and Joost. Their energy turns a medieval city into an exuberant adventure in cinema. (1) After preparing my lecture, I discovered a wonderful website on citations in Godard, with special focus on Le mépris. The Zommerfilmcollege gang, in 2.35 Scope. Photo by Esther Dijkstra.